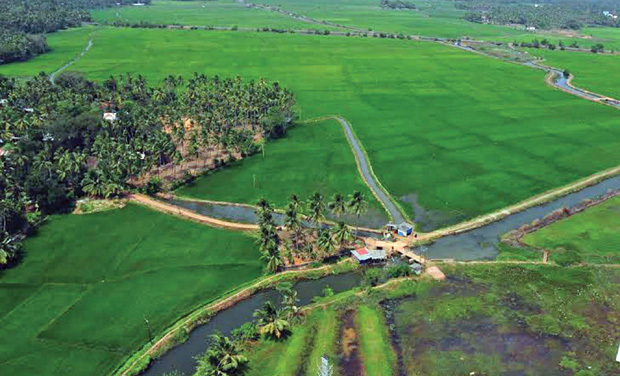 DECCAN CHRONICLE | NIDHIN T. R.
THRISSUR: The Adat model of development is a much talked-about term among the grama panchayats. It stands out by providing free seeds to farmers and the farmers' bank guaranteeing Rs 45,000 per year for an acre to all the paddy farmers who are part of its combined organic paddy cultivation scheme spread across 600 acres. As many as 5,000 persons in the civic body comprising 18 wards are availing pension through government welfare schemes, and all BPL cardholders among senior citizens get free medical treatment. The UDF-ruled panchayat has won several awards since 2005, including Panchayat Sashaktikaran Puraskar of the Central government and the state's Swaraj Award for the ideal panchayat. The civic body has amassed several lakhs of rupees as prize money which went into the panchayat building named Award Bhavan, constructed in 2012 spending Rs 45 lakh. The civic body rose to fame with achievements in agriculture, waste management, drinking water and welfare schemes after the UDF came to power in 2000, and the youth leader Anil Akkara took up the mantle as president. Since 2000, for three consecutive terms, UDF has held on to power. T. Jayalakshmi of UDF, who is now the president of the civic, body told Deccan Chronicle that in the last five years, developmental activities worth Rs 40 crore had been taken up utilising the Plan fund, MLA funds, World Bank aid, district panchayat funds, I3th Finance Commission grant, Rural Integrated Development Funds and others. “There is no dearth of funds for development. But the civic body functionaries need to visit often the secretariat in Thiruvananthapuram to know about different schemes and avail of funds,” she said. The panchayat boasts of a proper waste management plan in place in all its wards, running water in taps every day through the minor drinking water schemes along with that of KWA and 29 anganwadis.